Cruise was 19TH in his first 4* at Lexington in 2009. He has placed well in numerous advanced horse trials, including 7th at the Maui Jim CIC3* & was 10th at the Fair Hill CCI3* in 2010. He has started out the 2012 season with a great run at Intermediate & the plans are to move him back up to Advanced in February at Rocking Horse II. Thanks to Cindy Lawler for the above photo and this photographic slideshow at Rocking Horse I, 2012. He is truly an upper level event horse, is a lovely ride and is a fabulous dressage horse. IF INTERESTED IN WHOLE OR PART OWNERSHIP OF ANY OF THESE OUTSTANDING HORSES, PLEASE EMAIL SUE TUCKERMAN OR CALL BRUCE DIRECTLY @ 484-431-8262. Lusty is another fantastic example of a top home bred from Chesterland. 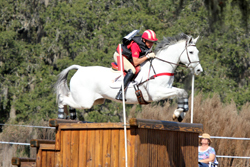 She has been 4th at the Jersey Fresh CIC***, 4th Richland Park & 11th at Bromont in 2009. She is qualified & in training for Rolex 2010 with Boyd Martin in the irons. She is a very elegant mare & a schoolmaster over the jumps. Lusty is brave & outstanding on cross country, an exceptional show jumper: A true international 4* horse in the making. Lusty Rocks Rolex 2010 finishing 11th out of 70+ competitors. See Full Results! Lusty's new owner Whitney Weston, trains with Buck and is successfully moving up the ranks with Lusty. Keep up to date with Lusty and Whitney's progress through her blog! Many thanks to Cindy Lawler for this photo update from Rocking Horse 2012.